I'm not sure if container gardening is the right Forum for these... they are very large containers I guess (4' X 8'). I've posted several times about how I make my raised beds from stacked 4X4 fence post, but I never got around to doing pictures. 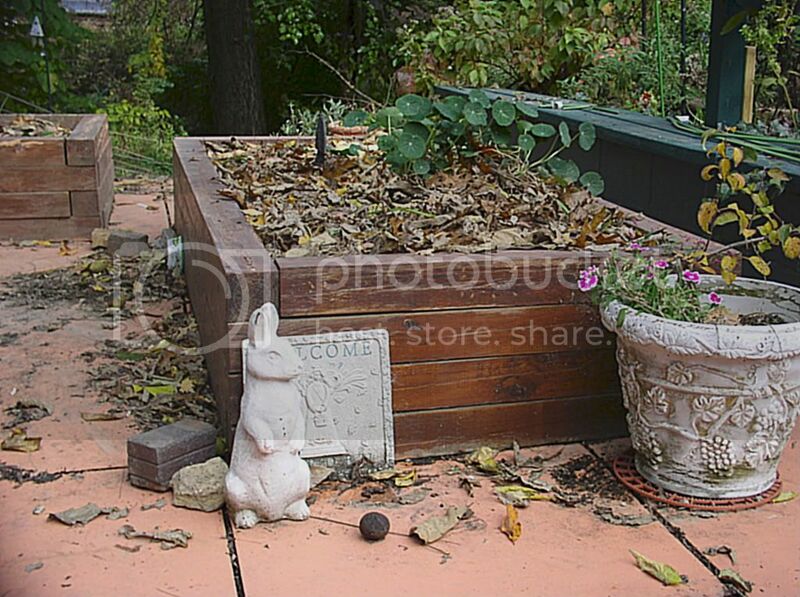 Here's a photo of two of them sitting on the concrete patio, all mulched and put away for the winter. I have one more of this style, plus other beds that are just landscape timbers or whatever. Incidentally when we bought the house, the patio was just a plain grey concrete slab. I hired a guy to come in with a big concrete saw and cut the grooves and then stained the concrete. Now it is quite an excellent imitation of terra cotta pavers and very much prettier. PS Built these 8 years ago and they are still very solid. Cooli-ooli Did you uses nails to keep em' together? No, would never hold. Super long drill bit to drill holes straight down through the stack, then pound steel rebar in. Very solid! 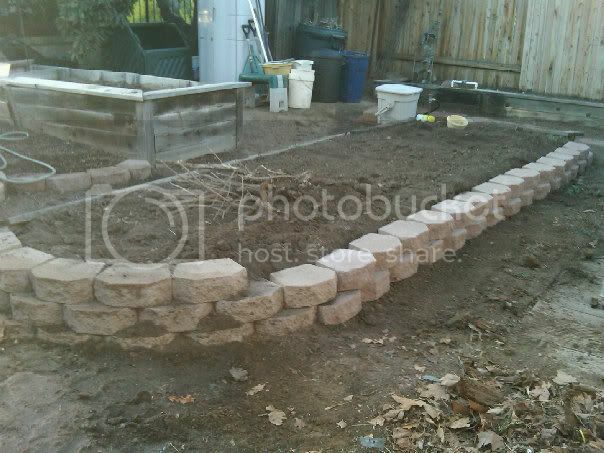 Thank you for the input... it actually has me thinking of raised beds and a potted Herb garden instead of ground work. If using raised beds do you just dump top soil in them or is there a need for fertilizer, mulch etc...? When I built the boxes, I had a truck load of topsoil brought in, because there wasn't any decent topsoil anywhere on my property. I filled them with that and then added compost, potting soil, and other organic materials. Since filling them, I treat them like any other garden bed and just keep adding compost and mulch. This fall when I pulled out the finished stuff, I put down a new layer of compost and then a layer of leaves. In the spring, I will crunch up the (by then a bit weathered) leaves some and turn all of that under. Then I will plant with more compost and then mulch once the soil is all warmed up again (in cold climates you don't want to put down mulch too early, slows the soil warm up). But one advantage of working with raised beds is you are working with an enclosed limited soil sample, so you can make it highly enriched. Do you have a link to your posts about how you built them? I've mentioned them several times, but it is very simple construction. If you click on the picture it gets bigger so you can see detail. They are cheap 4" X 4" pine fence posts. 8' lengths, some cut in half to be the 4' short sides. I just stacked them up box shape, no mortar or anything (you want water to be able to escape). (Looking at the picture, the one in the back shows the stacking pattern better, I probably should have moved the "garden art" .) Took a big long drill bit and drilled holes down through the stack and pounded steel rebar into the holes. Then I sealed them up inside and out with waterproof stain/varnish in several coats. I've obviously never redone the inside since I filled them, but every couple years I refinish the outside partly for cosmetics and partly to help the wood keep lasting. Those have been sitting there eight years now and they are still very solid. The last place I lived, I built raised beds just out of boards and they were falling apart after just a few years. Since these sit on a concrete patio, I put a layer of gravel in the bottom for drainage, but you wouldn't want to do that if you were building them on dirt. The drainage was my biggest question. So I assume you don't seal the bottom in any way so that the gravel can direct water out of the box if needed? Yes, you want the water to drain out, so don't seal the cracks between posts or the bottom. As noted, I put the gravel in for drainage because it is sitting on concrete, but if you are building it on dirt, don't put the gravel in, the water will just seep down into the underlying soil. It's just a 4-sided frame to hold soil in place. Ours are falling apart. I had to put in new brick supports because the wood is just falling apart. Is there an issue with using all brick? I have a huge amount of bricks that I need to use for something. I already put in several walkways just to use them. and we use them in other parts of the yard and they are quite good at retaining dirt. For now it is holding it's shape but I think it will be necessary to reinforce it before I end up with a huge mess. Like I said, the beds made from boards tend to fall apart. Mine from stacked posts don't. The bricks are made for retaining walls, so they retain soil just fine (I've built 3 retaining walls out of them so far, for my hillside), but there can be an issue with drainage. I think you want some space for water to get into and out of. I just built two planter boxes for my concrete patio (no grass or dirt anywhere in my small backyard to put them), and am about to fill them. I see that Rainbow Gardener suggests gravel to help with drainage... should I layer anything else in there (like sand) between soil and gravel? How much gravel, do ya think, 2 or 3 inches? 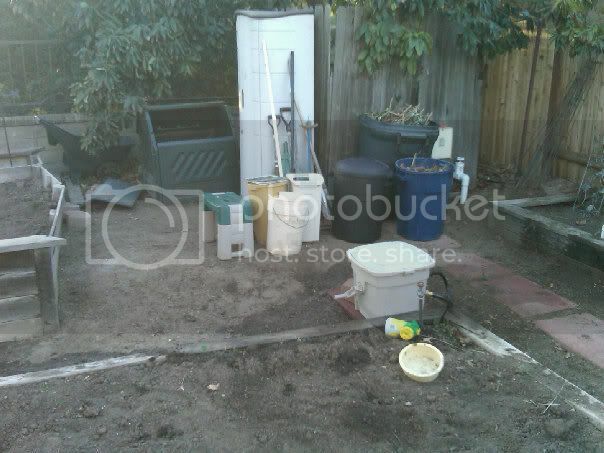 My main concern is keeping the soil in the box, and not draining out onto the concrete. Thoughts? I just used a little gravel, maybe an inch, because it was all I had on hand. I did lay down a few bigger chunks of rocks and broken pottery and whatever was around first and then the inch of gravel. I just put the dirt down on top of the gravel. I did put a liner of deer netting inside the box, stapled to the sides, just to help hold the soil in. It has worked fine and I have very little to no soil leaving the box. But I don't know that I needed to do any of that. The main thing is that since you aren't connecting the soil in your box to underlying soil, you need to build the box deep enough, deeper than people usually build them when they are on the ground.